Turks and Caicos boas are native to the Turks and Caicos Islands (TCI), which is comprised of more than 200 individual islands. Although they can reach a maximum length of six feet, specimens that reach this size are very rare and average adult size is about three feet. Due to their small size, extremely docile temperament, and beautiful rainbow-like sheen, these snakes were heavily collected for the pet trade in the 1970s. 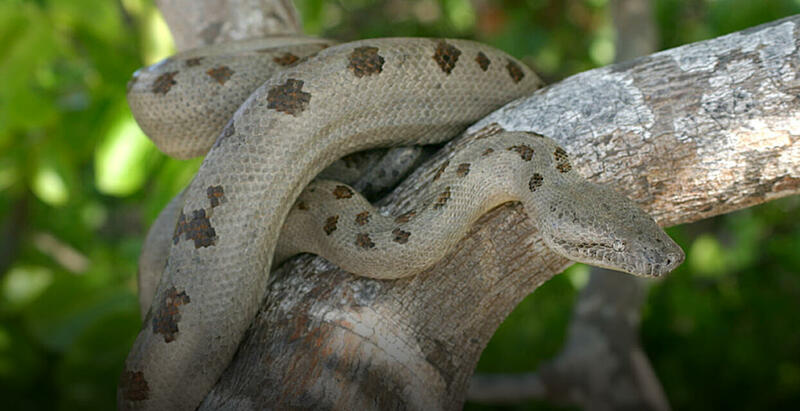 To address this, Turks and Caicos boas have been protected from international trade since the 1980s. Recent survey work found that they occur on only 11 islands, although they are known to have been extirpated from at least three large islands and may have had a much wider distribution historically. Together with our partners, we are working with developers and property owners to find ways for boas and people to coexist on private islands, including using dirt roads and golf carts to minimize vehicle strikes, and establishing restrictions for pets and other non-native mammals. Our Population Sustainability team is working to educate the public on the uniqueness and ecological value of boas, and dispel the common misconception that these snakes are venomous and dangerous. To increase our knowledge of boas, we are studying their ecology, behavior, and population genetics. Together with our colleagues, we have a long-term population study on Big Ambergris Cay, where we have over 450 snakes marked, allowing us to measure movement, growth, and survival rates, and to track changes in population size over time. Big Ambergris Cay has the largest and densest population of boas remaining, but is privately owned and undergoing extensive development. With our partners, we investigated genetic diversity among island populations. This work revealed almost no genetic divergence among populations, suggesting we may be able to manage all remaining island populations as one. To foster greater awareness of boas among the public and increase the capacity of our local conservation partners, we are actively engaged in education, outreach, and capacity building activities. These include producing displays for the Turks and Caicos National Environmental Center, conducting workshops for local educators and environmental professionals, publishing popular articles in local magazines, and conducting interviews for local TV.